Maureen McDonnell sentenced: Former first lady of Virginia receives 366 days in prison for corruption. 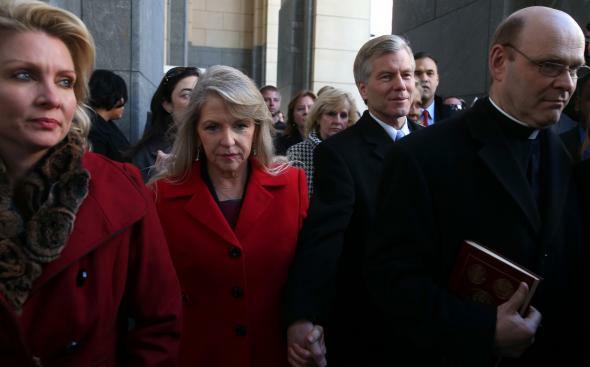 Maureen McDonnell, center, was sentenced to 366 days in federal prison Friday. Maureen McDonnell, the former first lady of Virginia, was sentenced on Friday to one year and one day in federal prison for her role in the corruption scandal that brought down her husband’s political career. McDonnell’s punishment was lighter than the 18 months requested by the prosecution, but harsher than the 4,000 hours of community service proposed by the defense. The Washington Post notes that McDonnell was fortunate to receive that 366th day in prison, because it allows her to potentially accrue 54 days off for good behavior. Maureen McDonnell spoke publicly about her case for the first time at her sentencing, telling the judge that “the cry of my heart is that I am sorry.” She also blamed herself for befriending Star Scientific executive Jonnie Williams—the central figure in the McDonnells’ downfall—and agreed with the judge’s description of Williams as “the serpent.” During Bob McDonnell’s time as governor, Williams gave the family more than $170,000 in designer clothes, high-end travel, wedding catering, and unofficial “loans” in an attempt to have his tobacco-derived supplement Anatabloc studied by scientists at Virginia’s state universities and covered by state employee health plans. During their joint trial, Bob McDonnell’s defense strategy amounted to what U.S. District Judge James Spencer summarized on Friday as “throw Mama under the bus.” Bob’s team of lawyers blamed Maureen for convincing Jonnie Williams to give the couple gifts without Bob’s knowledge, claiming that Maureen had no influence of her own to peddle and that no crime had been committed by either of the McDonnells. The jury disagreed, convicting them on multiple counts of corruption in September.